The 8751A network analyzer is a high-throughput instrument with lab precision that covers 5 Hz to 500 MHz. 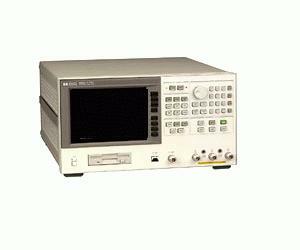 The Agilent 8751A provides resolution of 0.001 Hz, 0.001 dB, 0.001 degree, and 10 ps for characterizing the linear behavior of either passive or active networks, devices, or components in the lab and the production test areas. The built-in 1.44 MB disk drive is for direct save/recall of instrument state, calibration data, and application programs for your customization. Dedicated 50/75 Ω S-parameter test sets, 50/75 Ω T/R test kits, and the 1 M Ω input adaptors are all available.